In 2017, UNFPA, UN Women and UNV in Sri Lanka developed together a joint UN project on the 'Participation of Youth and Women in the Peacebuilding process', to empower women and youth with a greater understanding of peacebuilding issues and to catalyze their participation and engagement in governance and decision-making processes and responses related to sustaining peace. Training of youth leaders in the Central Province in peacebuilding knowledge, skills and values through the UNFPA, UN Women and UNV joint project, Participation of Youth and Women in the Peacebuilding process. The PPP has recognized youth to be meaningful and empowered agents of transformative change, and as contributing towards a culture of peace. The youth component of the project is directly aligned with the UN Security Council Resolution (UNSCR) 2250 on Youth, Peace and Security that was unanimously adopted in 2015 recognizing the positive role that young people play in promoting peace and preventing violence. Under the project, which is funded by UN Peacebuilding Fund (UNPBF) and UNV Special Voluntary Fund (UNV SVF), UNV is responsible for a specific component on strengthening the capacities of youth-led and youth-focused organizations to engage in peacebuilding processes/including UNSCR 2250. The team has developed a capacity building programme that consists of three phases: (i) four residential Trainings of Leaders on youth and peace in the project location: Eastern, Northern, Central, and Southern Provinces, (ii) Multiplying Youth and Peace Initiatives in the community; and (iii) Advocacy efforts towards youth and peace. Since March 2018, 93 youth leaders have been trained to strengthen knowledge (such as peace, conflict, violence, conflict escalation and management and gender among other), skills (project development and community mobilization) and values (nonviolent communication, empathy, respect to diversity and tolerance). 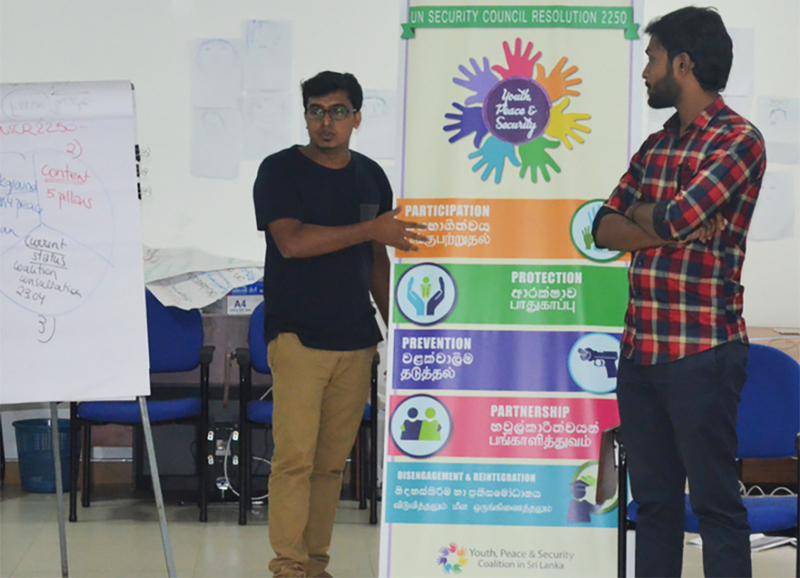 The trainings have been delivered by young peacebuilders themselves in Sinhalese and Tamil and counted with the support of partners such as UNFPA, UN Women but also the different provincial councils and the youth, peace and security coalition in Sri Lanka. These trainings have been crucial in empowering young people in engaging in peace initiatives in Sri Lanka and most important in providing young people a safe space to express themselves, to learn and interact with other young people from different ethnicities and religions. UNV Sri Lanka is committed to value young people as positive agents of change and crucial partners in building peaceful communities and supporting democratic governance. Moreover, youth volunteerism promotes civic engagement and active citizenship, which are solid building blocks for peace. The trainings are followed up with a monitoring phase where UNV PBF is supporting participants to implement their own initiatives under the youth and peace agenda. The UNV PBF team is currently composed of four National UN Volunteers, two International UN Volunteers and two interns. The team was also supported by an international University UN Volunteer from Japan. In addition, as part of the project activities, three national volunteers are being deployed to support national and local youth-led and youth focused organizations and institutions to mainstream the youth and peace agenda as well as localizing UNSCR 2250.